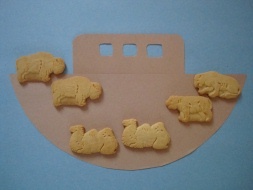 Help children learn the Noahs Ark bible lesson by having them make this easy and fun craft. Don't be surprised if the kids do a little nibbling while they're making their Ark! 1. Prepare the materials to make the ark - from brown construction paper cut a semi-circle and a rectangle (you can trace around a plate to make your semi-circle). Then cut a few small squares in your rectangle to make windows. 2. Glue your ark into place on a piece of blue construction paper. 3. Glue your animals, in pairs, on to the ark. One small, individual-sized box of animal cookies will make two arks (with left overs), and only costs about $1. If you're doing this craft with a group you can usually find animal cookies in bulk at your local Costco or Sam's club, or even at your grocery store.